This is by no means a scientific or unbiased list, merely a ranking of the best beers I have had during my short, but well-documented history of beer snobbery. Know that this list will be subject to updates and alterations as time goes on, and that many entries here have comparable equivalents, but got bonus points for being the first of their kind. Overall, this list reflects the range of my beer-drinking experience, which is admittedly a bit limited due to geographical boundaries and import/export laws. In the end, I compiled a list which I felt was both eclectic and international. But as always, the top spots get reserved for the beers that have stuck with me over the years, irrespective of where they came from. So without further ado, here is my top ten list of the best beers of all time. Enjoy, and remember that suggestions are always welcome… and don’t drink and drive! McAuslan’s St.Amboise Milennial Ale: This vintage ale was released in honor of the year 2000, and remains the best beer I’ve ever tasted. Dark, with rich, viscous malts, a nice hop bite and a slightly-sweet finish that reminds one of molasses, this beer has got it all! Not to mention a really strong kick (10% alc/vol)! In 2003, I discovered and exhausted what I believe was the last known supply of it, but the memory of it lives on! Schnieder und son Aventinus: Back in 2000 when I first walked into the Vineyards establishment in Ottawa, I asked the barman if he had anything tall, dark, strong and German. Good thing he knew we were talking about beer 😉 What I got was this, which fits that description perfectly! Known as a hefeweizen doppelbock, this beer is a German wheat, double-fermented, and done in the bock style. The result is a dark beer which boasts rich malts, mild hops and a complex palate with notes of cholocate, plums, banana, and spices. Apparently, this the Vineyards brewmasters favorite beer of all time. Go figure! Creemore Urbock: A signature creation by this southern-Ontario brewery, and the beer that introduced me to bock. Smooth, dark brown and translucent, with a velvety texture made possible by rich malts and subtle hops, the beer goes down easy and has a delightful, semi-sweet finish that is sure to please! To this day, I have found few other bocks that can its rich, smooth, and tawny taste (Hoyne’s Big Bock is the only thing that comes close). Westmalle Triple: A Trappist classic, and the one which I discovered shortly after St. Ambroise’s Millennial Ale was no longer in stock. Boasting a distinct Belgian flavor, a rich matly palate, a nice hop finish and a touch of sweetness – all of which is consistent with a great strong ale or Barley Wine – this beer quickly took over as my go-to. Years later, I still enjoy it’s charming and subtle flavor. 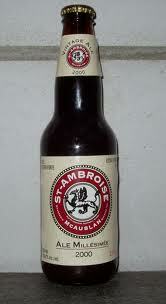 St. Amboise Pale Ale: One of the best pale ales I’ve ever had, and that’s no idle boast. Given the fact that Pale Ale is one of the most popular styles of beer in the world, especially amongst crafter brewers, there is no shortage of competition in this category. And yet, St. Amboise makes a pale ale that is a cut above, being at once refreshing, crisp, and hoppy, with a lovely floral aroma that tantalizes the senses. I am fortunate to be able to find this one here in BC, for even after many years it remains a go-to for me whenever I am in the mood for a crisp, refreshing beer with a good hop bite! Chimay Red: Another Trappist ale, boasting a rich red hue, strong malts and a distinct oaky flavor that is an admittedly acquired taste, but one which you will not lose once you get get the hang of it. Much like all Trappist beers, this ale is the product of centuries of tradition and is still made by monks in Belgian monasteries. Like all Belgian beers and barley wines, best when drunk from a specialized glass and savored slowly. Orval Trappist: Yet another Trappist classic, and definitely the one which I think is best paired with desserts. Dark, with an oaky taste and a subtle notes of fruit that are reminiscent of sour cherries, this beer goes well with anything sweet, and is also delicious on its own as a liquid meal-chaser! Anytime I’m at a bistro or international beer bar that specializes in signature creations or Belgian brews, I am sure to include this one to the lineup. A must-try for any aspiring beer enthusiast! Hart Amber Ale: Thought they are no longer available in their original form, Hart beers are amongst the best I’ve ever had. Brewed in Carleton Place under the watchful eye of an inspired brewmaster, Hart beers were once the pride of the Ottawa Valley when it came time for beerfest or the brewers awards. They have since shut down, regrettably, and were taken over by brewers of inferior qualification. However, the Amber that was once made is still one of the best beers I ever had, possessing a floral nose, a deep, satisfying taste, good malts, and a deliciously hoppy finish that taught me much about the world of beer and beer making. I tilt my hat to the Hart operation and the wonderful tours it conducted! RIP! Russel Nectar of the God’s: This beer was one of my favorite new beers of 2014, and worked its way into my heart as an all-time favorite. Made half of wheat and half of Munich malts that delivers some deliciously fruity esters, it is also aged for four months in Tennessee Bourbon Barrels to give it a hint of vanilla and a smokey, whiskey finish. Wonderfully complex and very well balanced – in spite of its strength (10% alc/vol) – this beer is definitely one of the best I’ve had in recent years. Swan’s Legacy Ale: The anniversary ale of Swan’s brewpub located right here in Victoria BC, this beer is a recurring feature over at the pub, available every so often in celebration of another successful year. A barley wine, it has a red-brown hue, is clear and combines strong, sweet malts with the citrusy kick of west coast hops. Beautiful to behold, with a floral nose and a lingering, sweet and bitter finish, this beer is a charmer. And, consistent with the character of a barley wine, it comes in brandy snifters and is best when savored slowly. Lorne Hart The genius behind Hart Brewery in Carleton Place was instrumental in setting of the brew pub at Ashton Ontario. They have a great selection including the Ashton Amber which may be similar to the Hart Amber Ale you listed as 10. Here is there list of beers. Lovely! I will be sure to drop in the next time I’m in town. I have at least one if not a few unopened Milennials in my parents cellar. I also have multiples of all the Trappists brews and other Belgians from the same era (99-02) and the other McAuslan/St Ambroise special editions. I also have a variety of 12 year old plus Barleywines that I have been cellering also. They have all been there for up to 14 years under the same conditions. I am going to have a tasting party to end them all sometime soon! 1. Little Creatures Pale Ale from Australia. 2. Sierra Nevada Pale Ale from USA. 3. BrewDog Punk IPA from Scotland.